1. 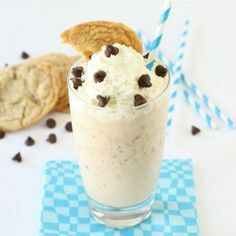 Place vanilla ice cream, cookies, chocolate chips, and milk in blender. Make sure the lid is on tight and blend until smooth. 2. Pour chocolate chip cookie milkshake in glasses. Garnish with whipped cream, chocolate chips, and half chocolate chip cookie, if desired. Serve immediately.